TOGAF in its Enterprise Edition remains what it has always been, namely an architecture framework – a set of methods and tools for developing a broad range of different IT architectures. It enables IT users to design, evaluate, and build the right architecture for their organization, and reduces the costs of planning, designing, and implementing architectures based on open systems solutions. 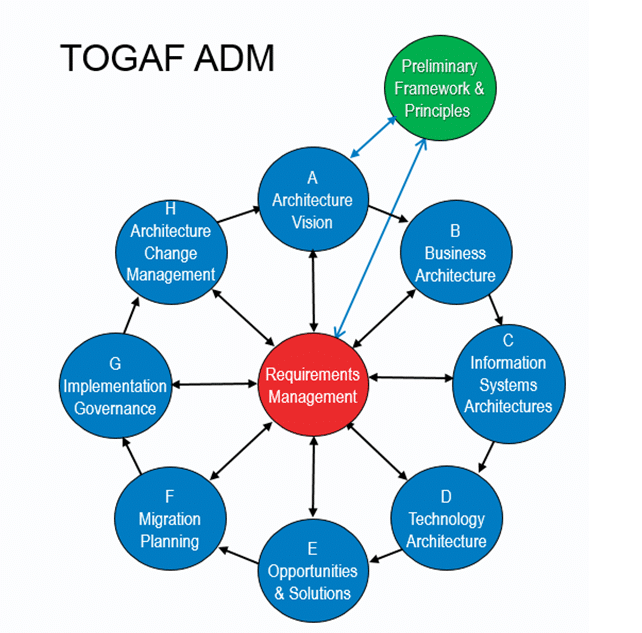 The key to TOGAF® remains a reliable, practical method – the TOGAF® Architecture Development Method (ADM) – for defining business needs and developing an architecture that meets those needs, utilizing the elements of TOGAF® and other architectural assets available to the organization. As governance has become an increasingly visible requirement for organisational management, the adoption of governance into TOGAF®, aligns the framework with current business best practice and also ensures a level of visibility, guidance, and control that will support all architecture stakeholder requirements and obligations. Who would benefit from using TOGAF®? Customers who design and implement Enterprise Architectures using TOGAF®, are ensured of a design and a procurement specification that will greatly facilitate open systems implementation, and will enable the benefits of open systems to accrue to their organisations with reduced risk. Enterprise Architecture (EA) is a well-defined practice as well as theoretical blueprint for conducting business analysis, design, planning, implementation and execution of successful business strategy. EA allows Enterprises to achieve the harmony between IT efficiency and business innovation. The technical advantages that result from a good Enterprise Architecture, bring important business benefits. When done properly, Enterprise Architecture (EA) is the critical mechanism for Enterprise efficiency in short, mid and long terms. EA impacts the effect of the business operational processes, their cost and associated risks which are the key factors for company efficiency even at trough times. TOGAF supports the journey with Enterprise Architecture and helps Organisations fulfil business strategy. Please feel free to speak to one of our advisors to obtain the course plan and timings. To become TOGAF certified you must pass The Open Group’s examinations. These are held at third party examination centers worldwide, with the accredited invigilator. We shall issue an exam voucher which will need to be redeemed via The Open Group whereby you will be able to book a location and date that suits you. As part of the TOGAF Level 1 and 2 course, we issue the combined voucher as standard, meaning you will take Level 2 directly after the Level 1 exam, if you wish to take them separately please mention this to our booking team. If English is a second language (ESL) and you are not in a country on the ESL exemption list, but still need extra time to do the exam, you will need to contact the Open Group (https://help.opengroup.org/home) for an ESL code which you will them use when booking. All ESL bookings will be done through the invigilator’s customer service by phone and not via the online registration process. Should your country be in the exemption list you will automatically be awarded an additional 30 minutes. The standard ESL extra time is set at 30 minutes, this includes doing TOGAF 9.1 Level 1 &2. If you are doing the combined exam for Level 1 & 2 certification and wish to have 60 minutes please specify this when speaking to the Open Group Help Desk https://help.opengroup.org/home. Without our email confirmation no reservation will be guaranteed. Link with ATE Guide in PDF has been sent on your email.